Check-in at the hotel. Overnight in Phnom Penh. Colonial District (Option, if time permits and if you wish): the Grand Hotel, the Post office, the Bank of Indochina, the Police station, the Superior Residence, the Treasury Bridge, the Chamber of Commerce, the Library and the Railway Station. 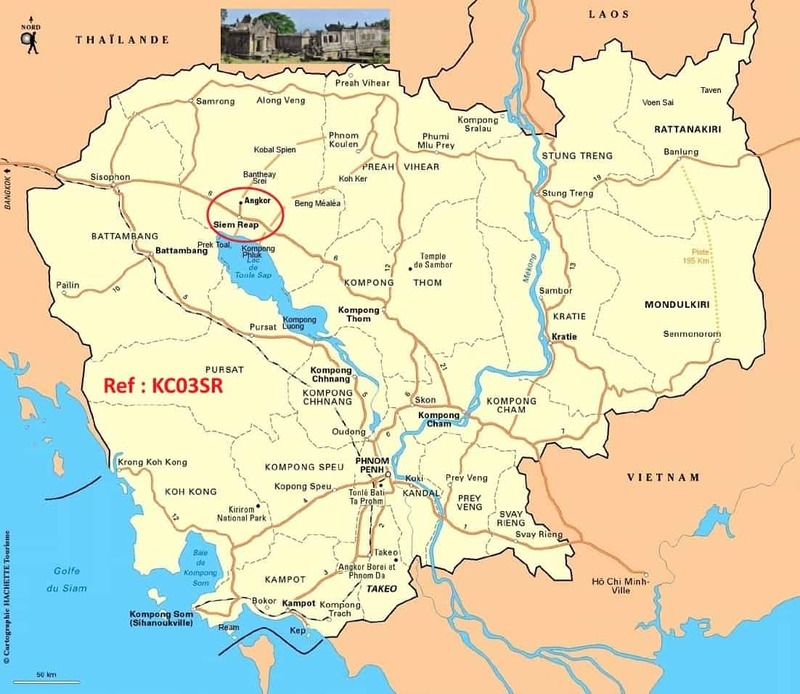 Direction: Kampong Cham (about 130km for about 2h30-drive) located in the most populated agricultural province of Cambodia. Optional stop at Skun: a transit point where you will meet any sort of travelers. Enjoy insects (grasshoppers, locusts, scorpion, fermented ants - taste like a crunchy hazelnut) and local fruits (fresh or dried) green mangos, pineapples, bananas, etc... Adventurers will play with tarantulas in full hands or crunch its legs. In Kampong Cham: Burn incense sticks at legendary hills of Phnom Pros and Phnom Srei. You will be welcomed by monkeys waiting for your bananas. Discover of the temple dedicated to Buddha built by King Jayavarman VII in the thirteenth century. Starting with the new road crossing the attic rice from Prey Veng province to Sen Monorom. Go on to Sen Monorom across the primary forest where wild orchids bloom. Overnight at the Lodge or guesthouse that you choose from our selection. Starting in the late afternoon for PHNOM DOH KROMOM, the highest point where you get a panoramic view of Sen Monorom, as well as the sunset. You can do it the next day if you wish. Overnight in Lodge or Guest House. 4x4 day on the slopes to discover the Bousra waterfall which is the most important waterfall of Cambodia, located 35 km from Sen Monorom. Possibility for bathing. More access to descend down the waterfall Bousra: If you are in good physical condition, return and take the wooden stairs, if not down where there are small shops on the left side at the end. We will continue the track to get to the village, where the majority ethnic group of Phnong lives. On site, there is a Catholic mission with its two churches. If you bring along some clothes, colored pencils, notebooks, paper and medications with you, you candonate some. Return to Sen Monorom through villages populated by ethnic minority Stieng. Walk in coffee plantation. Optional supplement: you can taste coffee. Discover the village of POUTAIN lives the ethnic majority Phnong. You will see their long collective residential homes now abandoned in favor of more robust wooden houses, modern forces. Departure on an elephant back towards the waterfalls. You will cross by the green vegetation along a rapid where the Phnongs plant the manioc, banana trees, cashew nut tree, etc. Elephants "work" only 3 hours a day maximum, 1h30 per way, same for the return. At some difficult crossing points, walking behind the elephant is required. By mid-morning to mid-afternoon elephants are left standing, feeding, and bathing. Onroad picnic lunch offered. Note: you can help to groomthe elephant or just admire this unique spectacle. Depending on your fitness at the moment, you can return to the village POUTAIN on foot. Depart by road to Kratie (around 3-hour drive). Arrive in Kratie, take a unique moment on boat on the Mekong to observe freshwater dolphins, endangered species. Concerned, an inexplicably high pup mortality, inbreeding, disease and habitat destruction, but especially gillnets. Visit Wat 100 columns (in Khmer: Wat Sorsor Muy Roi) and the tomb of the princess Kror Pom Chuk which, according to legend, died after an attack of crocodiles in the Sambour district, the ancient city of Chenla Empire. The story goes that her spirit still haunts the region and the people of Kratie often speak of it. On-site visit the soft turtles conservation center (Family Trionychidae). This international project involves the long-term conservation of the wild population of one of the rarest freshwater turtles and the biggest in the world. Depending on your fitness at the time, possibility to climb the Sambok hill for a panoramic view of the region. Overnight at hotel on the river in Kratie. Or on the island Koh Trong (only if you spend more than one night). Road to Preah Vihear "sacred sanctuary". On the way, discover the Stung Trengtown, and crossed by the Mekong by the bridge inaugurated in 2015 (Approximately 6h00 of route includingstops). Break at Sraem (transit village of the Preah Vihearprovince). Continue by the old conflict zone between the Thailand and the Cambodia where “king of sun”Sûryavarman I built the temple of Preah Vihear dedicated to the god Shiva. At the foot of the hill, take a 4x4 to climb the hill to the temple’s entrance then continue by foot. At the peak,magnificent panoramic view on the Thailand. Back to Sraem at the end of the day (30Km). Overnight Sraem village in the province of Preah Vihear. Departure in the direction of Koh Keran impressive and abandoned temple in 120km of Siem Reap, built by king Jayavarman IV (AD 928-942). The story of the creation of this Capital is quite familiar to the Indian mythology MAHABHARATA. It was the big evolution in the Khmer architecture which prefers statues much more impressive than natural size. Prasat Thom has the shape of a 7-storeyed unfinished pyramid built within the temples which was built in the previous period. After a small rest in the hammock, we continue the visit another forgotten temple, Beng Mealea (Flower in the pond). The quality of the architecture and the decoration of this temple will amaze you in spite of the nature and the man who left it in ruin. Before of arriving in Siem Reap, direction to the Big Lake, visit the fantastic and unique village of the fishermen of Kampong Pluk, a village on the water,cut off from the world (only accessible by boat). You will take a boat to visit these houses on piles built only to face the floods during the monsoon. During the dry season, you will have a walk in this village surrounding a pagoda. You can observe the constructions and the renovations of houses and boats, the lifestyle of the inhabitants, the means of transport of the villagers who live 6 months on the water. Visit houses and small factories of fishes, small market etc. During the rainy season, you will embark on a boat to visit from one house to another and you will change later again a small boat to discover the flooded forest. Arrive at Siem Reap in the late afternoon. You will go to discover Siem Reap, beginning with "Psar Chas", the old market. Then city tour of the much livened up district situated behind the hotel Ta Prohm where you can walk in the evening (restaurants, massages, workshops, crafts…night market). Discover the archaeological park of the Khmer empire. Adjust the visit onspot with the guide according to your desire and curiosity (You can also follow the chronological order of the temple constructions). Visit the temples of the group Roluos marked by the beginning of the Khmer civilization. The royal temple of King Indravarman I, Bakong is one of first stone constructed temples,an architectural revolution of the period illustrating the cult Devaraja which gave legitimacy to the royal power. Continue towards the other temples of the group. Direction: the small temple Banteay Srei (Citadel of women) "Tribhuvanamahesvara". It is located 25km north Siem Reap, built in pink sandstone which make this motifs carved like the gem of Khmer art and which attracted the attention ofAndré Malraux in 1923.It is situated in 25Km North of Siem Reap. On the way back, visit small temples (Banteay Samré, Prasat Prei, Prasat Tor…). 6:30 p.m.: Dinner offered with "Apsara" showin the ’AMAZONE restaurant: enormous buffet of all kinds of Cambodian specialties with show Apsara (20 dancers and dancers). Ta Prohm, Banteay Kdei, Pre Roup, Tasom, Neak Pean, Krol Kor, Prasat Pithu, Preah Khan, Preah Palilay and Bakheng for the sunset. Overnight in Siem Reap.To Siem Reap it exist a quality show realized by the circus school of Battambang. (Strongly recommended but with additional charge, ask your guide to reserve at your convenient date. Phone: 015499480). This day is reserved for the visit the ancient capital of Angkor Thom and the famous temple of Angkor Wat. Option 1: Transfer to Battambang by private boat with hammocks for your comfort. You cross the Tonle Sap Lake and continue by Sangker River along Prek Toal Bird Sanctuary, and through the flooded forest (6 to 8 hours of motorboat depending on the season).Once arrive in Battambang, case by case, you will be transferred to the hotel by tuktuk or vehicle. This crossing is normally navigable throughout the year. If waters are too shallow, our boat will land you before Battambang and you will continuewith 4x4vehicle. When waters are low it's better to embark early, around 7:00. Throughout this journey you will see small villages on banks, fish farms, the local residents who is bathing, herds in the water, the fisherswith Chinese square nets and the agriculture scenes on 2 sides. Consult us about it when you wish. - A water hyacinth Workshop: In a large floating home, the women of the community produce general merchandise at the base of a variety of water hyacinth's "Long Branch." Water hyacinth is an invasive species. Osmose, a project who is trying to fight it by having local people make baskets from dried hyacinth. - A floating crocodile farm. · Wat ChoeuKhmao or "black wood" Pagoda ruined in a flooded area built by fishermen in 19th century during the Siamese occupation. · floating village Bak Prea: A restaurant on the water is available but, however we recommend taking a picnic (see the guide, we provide the water). Most of the agencies use a collective speed boat which does the trip in one breath by the main arm without guide, you embark with suitcases, and another guide waits for you on the other side to Battambang. According to the season the surface of the lake can vary of 2500 in 120.000 km ² (4 - 5 times). Generally from February till May the crossing is not possible for the collective boats. In Battambang we shall have the opportunity to see of numerous French colonial houses. Attention: This crossing along the Prek Toal bird sanctuary but it is not a business one. For a visit must devote a day and spend the night there to surprise the birds at daybreak ... Contact us. Option 2: in case of impossibility or if you do not wish to make too much boat: 9:00 am: excursion with English-speaking guide and private boat, on the lake Tonlé Sap, the visit the floating village of Chong Khneas, approximately 1:30 am of boat. Then road for Battambang and at the beginning the planned visits the next day what will relieve the program of the next day. The program of this day is a little loaded but feasible as indicated. Feel reassured, the guide will adapt this day according to your tastes and your rhythm. Early in the morning: visit the central market before taking TukTuk along the bank of the Sangke river by crossing Cham et Khmer communitiesuntil the Ek Phnomtemple. On the way, stop at Prohoc market to check your tolerance with the odoroffermented fish. Continue the rural visit to the old pagoda, Wat Samroung Knong sadly known by its prison activity during the Khmer Rouge regime. On the road, we will stop several times to observe the preparation of Krolann(pastry cake with glutinous rice, bean and coconut); rice pancakes; incense sticks; fish Nems. Afternoon: excursion by car until Prasat Banon or the hill Banon which is an attractive temple perched on the top of a hill, 368 steps to climb for the bravest. Then we will continue the road until Phnom Sampeou, 12Km of Battambang. At the top of a calcareous outcrop of Phnom Sampeou raises itself a set of temples, where the monkeys took up residence, with a magnificent view on the surrounding plains (A good physical condition is required). You will discover a profound canyon of "ghosts" and caves having served as mass graves in the time of the Khmer Rouges. The corpses of the tortured prisoners were thrown to it. At the foot of hill, before sunset, you can attend a magnificent show where millions of bats go out of the cave. - Notables' Old house in the village Wat Kor saved by the Khmer Rouges. - The Old house of the governor, the station, the colonial houses. Departure from Battambang to Pursat town, located halfway from Phnom Penh, we will adjust the departure time according to what you wish to do during this day. On the road pass by the Krokor market famous for its fish products. Back to Phnom Penh via the Kampong ChnangProvince famous for its floating villages and its potteries. At 36 km before arriving in Phnom Penh, visit Oudong, former Khmer capital. The palace was transformed into one of the most beautiful pagoda of this province situated at the foot of the Phnom Preah Jartroip hill (Mount Royal Treasury). Visit the silversmiths village situated in Kampong Luongvillage, Pongnea Loeudistrict. The morning at about 8 a.m.: departure by car then take a ferry for the Silk Island conscripts also Koh Dach on the Mekong, a heaven of peace in 15 km from Phnom Penh. In almost traditional houses, women weave silk and cotton fabrics. This discovery costs you a half day. Option: on the way back: visit the Russian market, visit the museum S21 "Toul Sleng" notorious center of torture and interrogation the prisoners under the Khmer Rouge Regime. Continue by following the road which had been used to deport prisoners up to the extermination camp of Cheong Ek, also known asKilling Fields. After all these emotions, for the amateurs of photos, you can climb to the 7th floor of the Sorya Shopping Center where you will have a panoramic view of Phnom Penh. Last shopping atthe central market. By late afternoon: transfer to the airport according to your flight schedule.